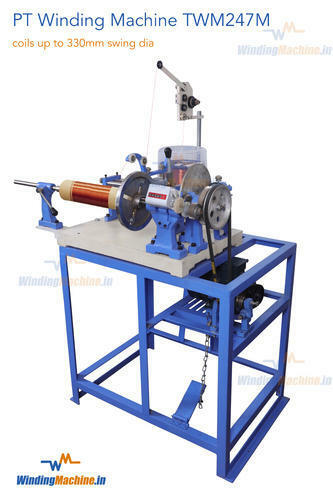 Justifying our position in the national market, we are engrossed in providing a finest class PT Winding Machine Up to 63KVA to the prestigious clients at a very inexpensive price. We are the leading Indian manufacturer of Coil Winding Machines, established since 1989. Our design, manufacturing, sales and after sales support is the best for the following range of Winding machines viz: Manual, Motorised, Semi-automatic and Automatic winding machines, catering to sectors like power, automobile, electrical and electronics, and many more. Chawla & Choudhary Trading Company Private Limited provides wide range of winding solutions including Transformer Coil Winding Machine, Voice Coil Winding Machine, Toroidal Winding Machine, Solenoid Coil Winding Machine, Pump Winding Machine, PT, HV, LV, SMPS and many more machines. These products are designed and manufactured in line with best of the industry standards. The entire range of products offered by us is very popular in the markets for their reliability, performance and afford ability. We are well known company in the winding industry with decades of experience in providing complete winding solutions. We have the highest client satisfaction in India owing to our machines efficiency, productivity, reliability and time-saving operations.